It’s really been a long time (years) since I read a time travel book. Heather Blanton did a wonderful job going back and forth between times. 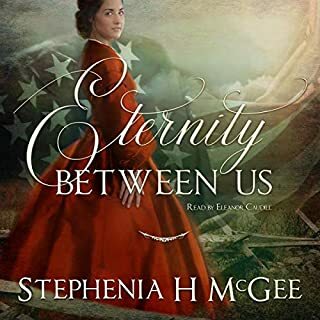 A great historical romance when Liberty traveled back in time. 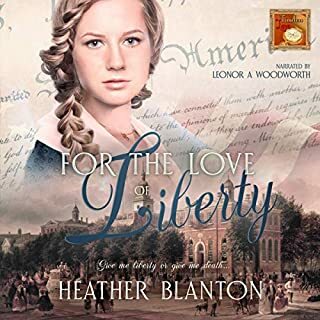 Spy rings in the Civil War, a man Liberty falls in love with and an ancestor being arrested makes Liberty feel like she has to save everyone and Martin was feeling like he was always losing Liberty. She kept me listening and on my toes to find out how it was going to end. Once you start this book you will not want to put it down. There is one word in the book that is used several times but not in a way that is ugly. You will see if you listen to the reason it was first used. If you like historical fiction and a little modern fiction mixed you will like this book. The narrator Leonor A. Woodworth did a wonderful job and the story came alive with her narration. I have listened to several books Leonor W. has narrated and they have all been good. She speaks plain and I don’t have to wonder what she is saying. 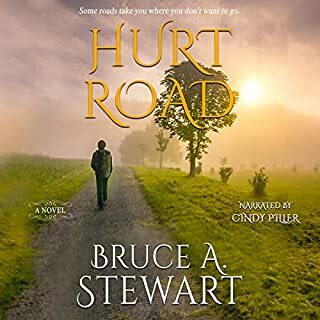 I received this audiobook free and was not required to write a positive review. All opinions are my own. 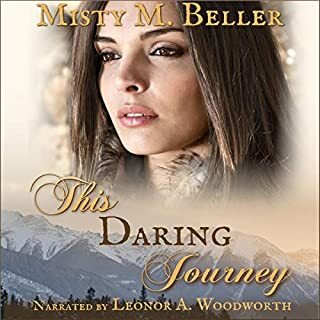 This was another great audiobook I got to listen to written by Misty Beller narrated by Leonor Woodworth. The narration of this book was wonderful just like all the other ones. This book is a treacherous journey over the mountains with barely enough food and sickness and cold weather. I love that Samuel and Moriah are both strong characters. Many things happened that kept me on my toes to see how they were going to get out of different situations. And there’s a baby to keep warm and alive too but Moriah and Samuel are very determined to keep everyone alive and get to a safe place. This is book six and can be read alone. I have enjoyed each book in this series. I received an audiobook from the narrator but was not required to write a positive review. All thoughts and opinions are my own. Much More Than Just War! Oh wow! I just finished this audiobook. 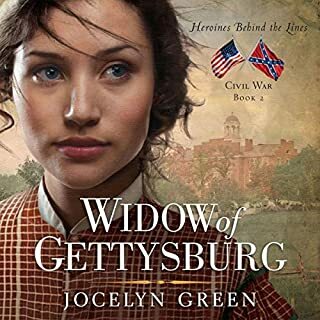 A Civil War story that will make you want to read/listen to faster but then hate to see it end. I loved the narrator and the different voices she did for the characters. I loved some of the characters and got mad at others. The horrors of war and the way the mothers and wives missed their men were so real. Taking care of the wounded wasn’t for the weak. I loved that Liberty and Belle were strong women. If Liberty was down she encouraged herself in the Lord. The love story was amazing and facts about Liberty, Belle and Silas were shocking. An inspiring historical fiction you will want to read if you like reading about war times but yet not all strategy and fighting. This book is so much more. I received a complimentary audiobook. All thoughts and opinions are my own. 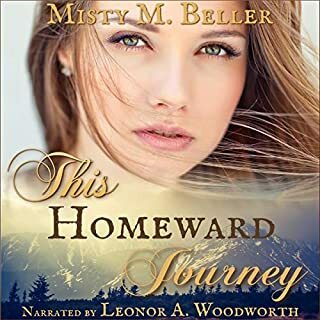 An audiobook narrated by Leonor A. Woodworth which is always great. She makes the story come alive along with Misty M. Beller’s great writing. I loved going along for the trip with Rachel and Seth as they go to the Canadian territories for reasons of their own. Rachel and Seth’s background sure made them an unlikely pair but can they overcome these problems? All kinds of trouble and hardships face them including Indians that they thought might kill them. I loved how she explained so vividly the horses going up the mountains taking their riders to the bottom. Read about the adventures and real life situations about trusting again. Rachel and Seth both have to learn to trust. Seth had to learn to trust that God would help him keep his life changed. Rachel had to learn to trust another man. A great story that I really enjoyed. I received a free audiobook but was not required to write a positive review. All opinions and views are my own. 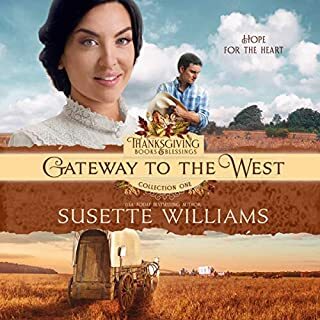 This was a great short story and is book 2 of The Thanksgiving and Blessings Collection. The author writes well and the narrator was great. Malcolm on the Organ Trail traveling west, allowed Haley to travel with them against his better judgement. Difficult times ahead and the loss of both Malcolm and Haley pulls them together. 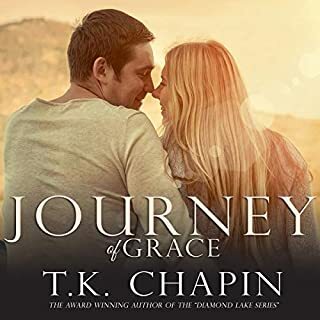 Read about the faith they both have that gives them the will and strength to keep surviving in their world of sorrow. Can they help each other with their grief? If you like Historical Fiction you will enjoy this one. I received an audiobook from the author but was not required to write a review. All opinions are my own. 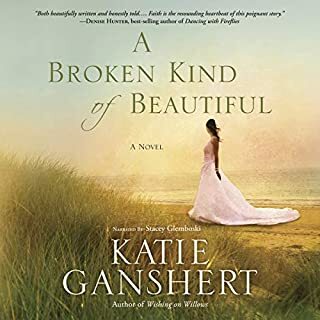 This audiobook was so enjoyable that I laughed out loud several times. The narrator made it even more humorous with his different voices for the ladies in the town. 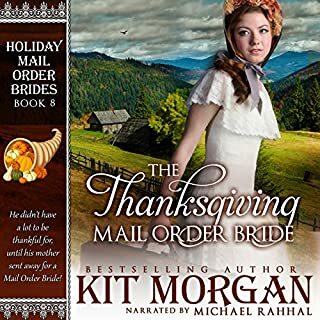 The book was a wonderful mail-order bride story. Troubles and misunderstanding follows Daisy and Morgan from the first. How could it not with an aunt like Morgan’s? Lol! Never a dull moment! I can’t remember where I got this audiobook but all opinions and statements are my own. A great story touching on several issues that are tough in life. The author did a great job showing each character’s personality and how they dealt with their problems. There are a couple things that don’t have complete closure in the book but I felt the story overall was great. I received a free copy from audible and was not required to write a positive review. All opinions are my own.